Friends of PopCult and RFC are appearing all over town Friday and Saturday, so you’ll have to make some tough choices while gorging yourself at the entertainment buffet. There’s music, comedy, and a benefit for the owner of one of the favorite watering holes of the denizens of TheGazz.com. First up, Andy Park, a member of The VooDoo Katz and future solo guest on RFC will be performing Friday night at Taylor Books at 7 PM. Andy’s an impressive songwriter and it’s always a treat to hear him at his singer/songwriter best. The next day, Andy will be at Bluegrass Kitchen at 6 PM, so you can grab a fine dinner along with the cool music. There’s no cover for either night. If you’re more in the mood to laugh your pants off, Friday is National No Pants Day, and The No Pants Players celebrate by opening a two-night stand at the La Belle Theater. Six bucks gets you in the door for an evening of fun improv games with West Virginia’s Improv Troupe. On a more serious note, Kay Dillon, owner of O’Kays (formerly Blues BBQ) has had a family tragedy. Her son was injured in an accident in Thailand, and a benefit is being held to raise money to send her over there to take care of him. A $10 minimum donation is requested. There will be door prizes, food, beer specials and live music. Buckstone, The Carpenter Ants, Joe Prichard and The Barkoloungers are on the bill, along with The Clementines, who you can see performing in the clip below. And that’s just Friday. Check back tomorrow for details on a full day of music on Saturday! 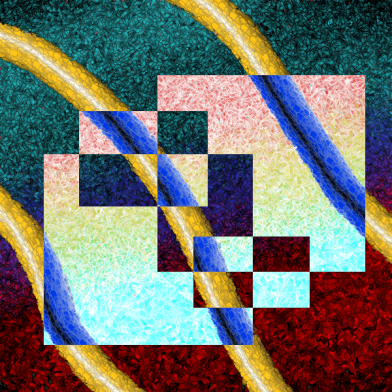 We kick off the week in PopCult (a few hours late) with yet another digital painting, this time an excercise in mucking with the geometric application of the negative image filter to what was a piece that I was less than happy with. You can see the original on the other side of the jump, along with news on the next Radio Free Charleston and stuff coming up at PopCult this week. Anyway, this here painting dates back to the batch of stuff I created for the Emily Haynes benefit. It’s not part of that series, but proceeds from this will go to still go to Emily and her family, so go over to the Cafepress stores and max out your credit cards. It’s for a good cause. As I write this, it’s looking like Cafepress is having technical issues, but go over there anyway and buy some stuff. This image will go up over there as soon as we can make it so. As is the norm, clickedy-click the image for a larger version. The internet gods willing, you can cruise over to the Monday Morning Art Cafepress store and purchase this image on a variety of garments and fine trinketry. Also, all of the artwork for Emily will be available from the PopCult Cafepress store at least through the end of summer. All proceeds will go to Emily. I’m also working on hooking up with a local gallery to sell prints of this work, again with all the proceeds going to my friend Emily and her family. Okay, I held off on this one for an extra day so I could wallow in more nostalgia. 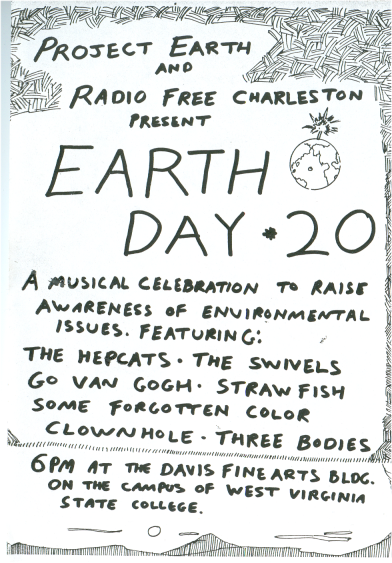 This week’s art is a flyer for the Earth Day 1990 concert that Radio Free Charleston sponsored, along with the group Project Earth on the campus of West Virginia State College (before it grew up and became a University). This was a high-water mark for the radio incarnation of RFC. I had to pull off promoting a concert on short notice with absolutely no support from the station management. By this point, the acting general manager was openly hostile towards RFC, and the program director was more interested in sacrificing the show so he could wrest the GM’s job away than he was in helping the station actually make money. But we pulled off a huge event. Seven bands took the stage at the Davis Fine Arts building. In between we had speakers and low-level bottom-feeding politicians, some of whom brought their own hecklers (whatever happened to David Grubb, anyway?). Campus security told me that, by their count, close to two thousand people drifted through the Davis building during the course of the eight-hour show. I was interviewed by WCHS TV (by a very young Tim Irr, in fact, back in his cub reporter days). Somehow we managed to provide free Gino’s Pizza and Pepsi products for the audience–who got in free. This week we’re taking a look back at the last couple of month’s worth of Monday Morning Art. We’ve been presenting seven pieces that I created for the March 2 benefit concert for Emily Gunter-Haynes, who is suffering from a variety of ailments. 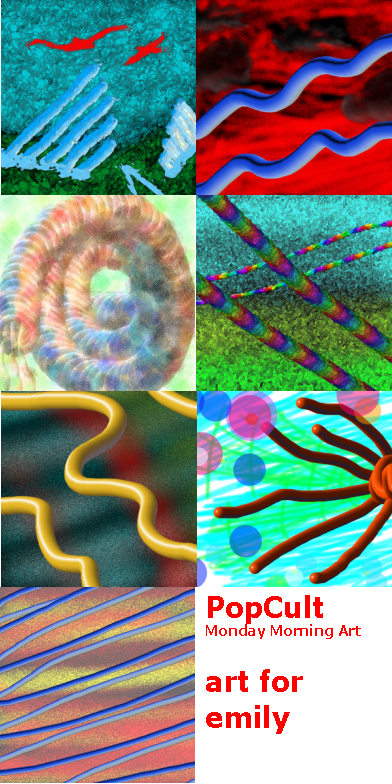 Time constraints prevented us from getting this group of digital paintings ready in time for the show, so I decided to hijack Monday Morning Art, and the Monday Morning Art Cafepress store to try and raise a few extra bucks for the cause. Since we had technical issues that prevented last week’s art, “Detail Work,” from getting uploaded until this weekend, I decided to take a week to look back. Also, all of this artwork will be available from the PopCult Cafepress store at least through the end of summer. All proceeds will go to Emily. I’m also working on hooking up with a local gallery to sell prints of this work, again with all the proceeds going to my friend Emily and her family. If any of this work strikes your fancy, please take the time to surf on over to the Cafepress store and pick up a shirt, poster, or card. Stay tuned to PopCult as we bring you more information on ways to help out Emily during this trying time. Follow the jump for a detailed look at each piece. Several RFC regulars have cool stuff going on this weekend that you can rush out and enjoy! Radio Free Charleston’s Resident Diva, Melanie Larch, along with No Pants Player Kevin Pauley, are both featured in the Kanawha Player’s production of Arthur Miller’s “The Crucible.” This story of the Salem witch trials was a thinly-disguised analog to the “Red Scare” of the McCarthy era HUAC hearings, but today, you can see a whole new layer of relevance to paranoia of the current administration. “The Crucible” starts at the Civic Center Little Theater tonight at 8 PM. Tickets are sixteen dollars, with student discounts available. In Huntington tonight, RFC guests Holden Caulfield hold court at Club Echo with three other area bands. The cover is five bucks, and the show starts at 10 PM. Tomorrow night, RFC’s adopted nephews The Concept invade the Boom Boom Room (formerly The Brickhouse) in St. Albans along with The Excitement and Pittsburgh band The Composure. The all-ages show begins at 5:30, and I will be there. Cover is eight meager dollars. Later Saturday, The Compusure and The Concept take the stage at the Blue Parrot with Meuwl and B. Rude. That show kicks off at 10 PM, and the cover is five bucks, I think. LIFE BEGINS AT 40: THE NEW-LOOK RFC! 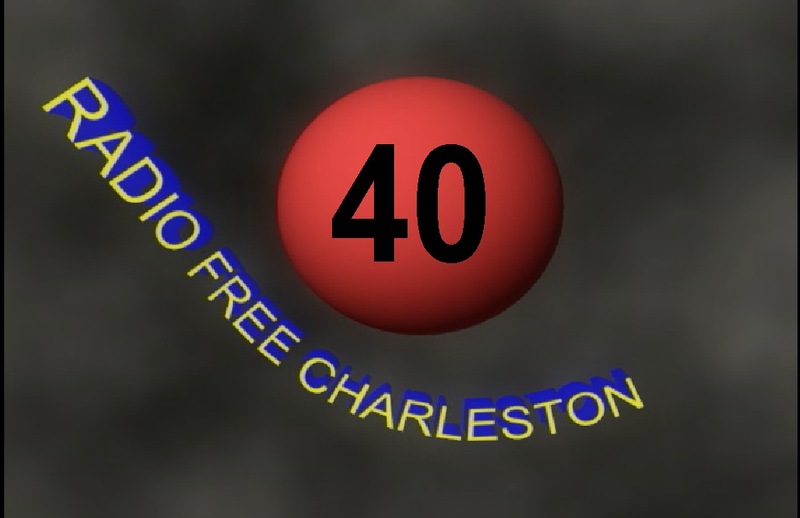 Radio Free Charleston heads into a bold new direction with episode 40 (ONLINE NOW!). This show features a slick new opening, new regular features and a fresh, upbeat attitude, as we continue to bring you the best local music, comedy, film and animation, but now we’re really getting serious about it! Host segments for this episode are shot all over the Kanawha Valley, on Charleston’s West Side, in Pinch, outside the La Belle Theater in South Charleston, and alongside the road in Big Ugly. The hats are banished with this episode! 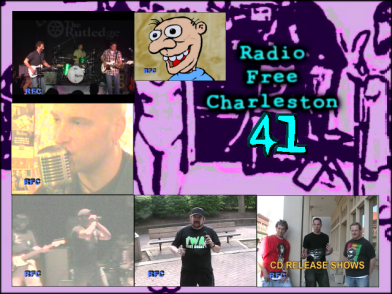 We have great music from Paul Calicoat (filmed at Route 60 Music) and Joe Slack (filmed behind the Kanawha County Public Library). The No Pants Players return with a hilarious April Fool’s Day Message, Award-winning filmmaker Eamon Hardimon graces us with the first of many installments of “Eamon In The Street,” and our animation this episode features Jerry “The King” Lawler in animated outtakes from his recent PopCult interview. 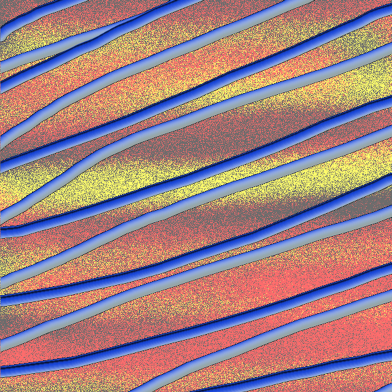 Today’s Monday Morning Art is the last of the seven pieces I created for the benefit of Emily Gunter-Haynes. Technical issues prevent me from updating the Cafepress stores today, but here’s a quick look at this week’s art. Check back tomorrow, when this post will be updated with links and more info on the art and Emily’s benefit. Above: Crowd favorite, The Necrobutcher, shows Viper the quick way out of the ring. 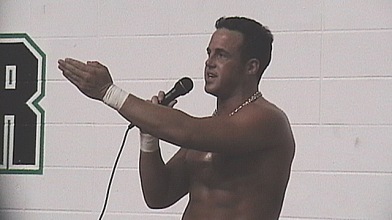 Below: Former WWE Superstar Joey Mercury pauses from telling the crowd how backwards West Virginia is to briefly extoll the virtues of Shaklee and the wonders of Multi-level Marketing. 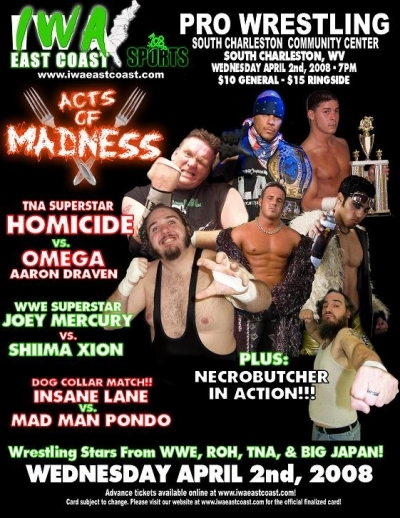 IWA East Coast returns to the South Charleston Community Center Wednesday night with “Acts Of Madness,” an evening of professional wrestling featuring TNA Superstar HOMICIDE, WWE Superstar Joey Mercury, and IWA EC favorites Mad Man Pondo, The Necrobutcher, Omega Aaron Draven, The Juggulator and more! Plus we get the return of the Amazing Super Oprah, easily the greatest transvestite Oprah Winfrey Impersonator wrestling today!